Time: 2:30 p.m. | 4:30 p.m.
ST. PETER, Minn. – The Gustavus baseball team opens the month of May with back-to-back Minnesota Intercollegiate Athletic Conference weekday doubleheaders versus St. Olaf College and Hamline University. The Gusties (12-15, 4-8 MIAC) will face the Oles (14-14, 4-8 MIAC) in Northfield on Tuesday prior to hosting the Pipers (13-17, 6-8 MIAC) on Wednesday. 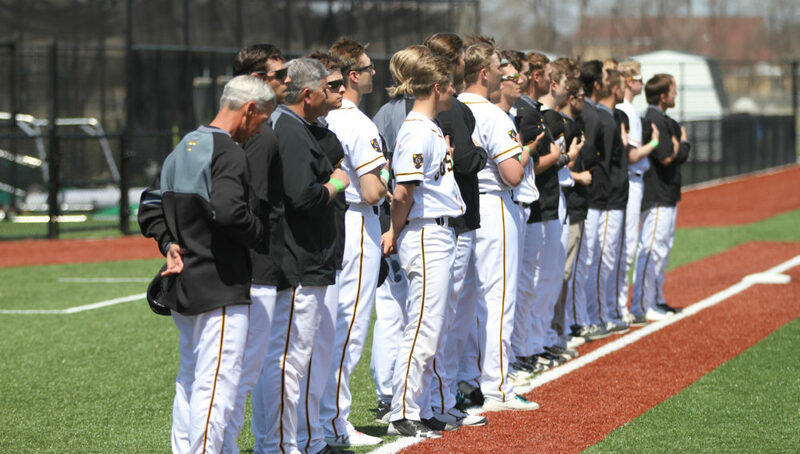 The Gusties had their senior day spoiled by Macalester College on Sunday, as the Scots took down Gustvaus with 5-0 and 10-3 victories for the series sweep. The Gusties were limited to seven hits in 14 innings. Tuesday’s games will mark the 169th and 170th all-time meetings between the Gustavus and St. Olaf baseball programs, with the Oles owning an 94-74 series advantage. The Gusties swept the Oles last season at Gustie Baseball Field with 6-5 and 13-12 victories. Wednesday’s games will mark the 160th and 161st all-time meetings between the Gustavus and Hamline baseball programs, with the Gusties owning a 100-58-1 series advantage. The two teams split last season, with the Gusties earning a 16-4 game one win prior to the Pipers salvaging a series split with an 8-3 game two victory. Nearly of the team’s runs batted in have come from Gustie first-years, as the freshmen have accounted for 54 of 119 RBI. Ethan Mocchi (Champlin, Minn.) is the RBI leader with 21. First year middle infielders Cole Pengilly (Le Sueur, Minn.) and Carter Clemensen (Cologne, Minn.) are two of four Gusties to have started in all 27 games. Pengilly is tied for the lead in the MIAC with four triples. Mocchi ranks second in the conference with 11 doubles and ranks fourth in the MIAC with a .616 slugging percentage. Ryan Moriarty (Jr., Le Sueur, Minn.) had his 14-game hitting streak snapped versus Macalester. The Gustie leadoff batter has started in each game this season and has reached base in all but one game. The outfielder tallied seven hits in six games last week and now leads the team with 29 hits. Nolan Lepel (Sr., Plato, Minn.) collected six RBI in six games last week, including a 2-3 performance with three RBI during game two at Bethel. Casey Lewandoski (Sr., Fairbanks, Alaska) pitched the final inning of game two’s 5-2 win at Concordia, notching his third save (T-2nd/MIAC) of the season.